Isber Sabrine, Chair of Heritage For Peace, gave a talk about the work of Heritage for Peace at the University of Puebla (Mexico): he participated in the first Forum of Young Heritage Managers organised by the University of Puebla (BUAP) held last November. In his talk, Sabrine considered the important role that heritage can play in Mexican society, which is traumatised by drug trafficking, terror, and a lack of security. He also confirmed the necessity to bring heritage to society, as heritage can unite people and play an important role on the reconciliation within the society. The ASOR’s Cultural Heritage Initiatives October 2017 Monthly Report is now available here. Archaeologists from ATPA in Al-Jazira canton have documented the damage to Raqqa Museum, here. In addition to heavy structural damage and looting, the museum has been mined. Archaeologists from ATPA in Al-Jazira canton documented more than 200 antiquities returned to the museum of Raqqa that had been stolen after teh area fell under the control of extremist groups (here). The Authority of Antiquities and Tourism in Al-Jazira, in cooperation and coordination with the local Council of Altabqa City, has started maintenance of Ja’abar Castle, formerly occupied by ISIS. For more information see here. The Authority of Tourism and Antiquities Protection Authority in Al-Jazira Province met with the Al-Raqqa local Civil Council in Ain Eissa regarding joint cooperation to protect the archaeological sites in Al-Raqqa. They also met with Al-Tabqa Civic Council to promote relations (here). The department of antiquities in Hasaka, in coordination with the commission of Arishah, documented the sites of Ajaja and Tawabir. They have also worked to document more than 150 restored mosaic panels (here), and a large mosque in Raqqa (here). Within the framework of cooperation and joint coordination between the General Directorate of Antiquities and Museums, the UNESCO, the Aga Khan Foundation, a coordination meeting was held in the city of Aleppo between the restoration experts in the three mentioned institutions. The plans of the restoration project of the stairs of the entrance to Qal’at Halab were revealed. To learn more see here. At the 30th General Assembly of the International Center for the Study and Preservation of Cultural Property (ICCROM), DGAM Mahmud Hammod presented plans to restore buildings in Old Aleppo. Read more on the SANA website here. Interpol posted a special appeal with a wanted list of items stolen from Syria’s Raqqa museum (link to pdf download). A new exhibition in Hungary featured photographs of Syria’s cultural heritage landmarks before and after conflict. Read more on the SANA website here. The US Justice Department sought a warrant to seize an ancient ring that was smuggled by a Syrian antiquities trafficker. Read more on Reuters here. The Financial Times discussed how new technology creates questions of authenticity and value with respect to reproductions of cultural objects. 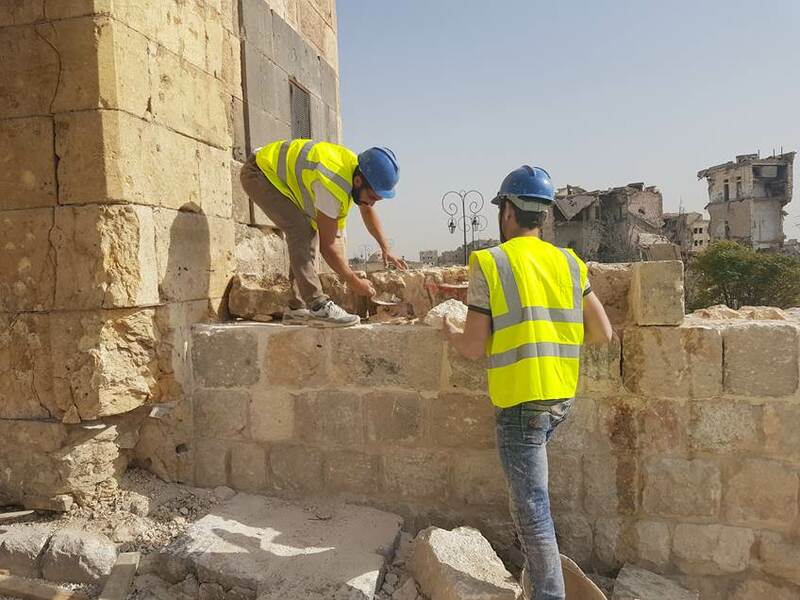 Arab News wrote about the cultural challenges of rebuilding Aleppo with new materials that lack the history and atmosphere of long-standing building. Hyperallergic examines how Syrian antiquities have been weaponize in the struggle to preserve culture. Audrey Azoulay, the New DG of UNESCO, warns that seventeen of the World Heritage Sites in the Arab region, including Palmyra and Aleppo, are in “danger” due to conflict. Read more on the Washington Post website here. Article in Paris Match (in French) discussing European antiquities sales here .